World 7-2 is the second level of World 7 in Super Mario 3D Land. This level takes place inside a castle filled with chained spiky cylinders. The first room contains many spiky rolls, two Chain Chomps and a bottomless pit with a narrow path, with more chained cylinders and an 1-Up Mushroom. Reaching on the other side, Mario must enter in a Door, that takes him to another area. In this area, soon after a Midway Flag, the plumber must cross a pink and blue tilting platform with rolling spike cylinders. Then, he must cross two Chain Chomps, four chained cylinders and two spiked boards, until enter in another door. It takes Mario to the final area. There are two tilting boards and the Goal Pole. Star Medal 1: The player should hit the red ! Block above the Chain Chomp thrice. This will create three large blocks that lead to the first medal. Star Medal 2: After the checkpoint, the second medal can be found on some Donut Lifts to the right of the seesaw platform. 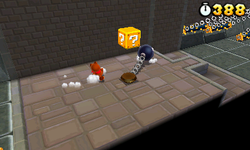 Star Medal 3: The final medal is found after the two Chain Chomps, right above a retracting spike platform.